Guangzhou Sino Group Co., LTD is a professional manufacturer and exporter, which is concerned with design,production and sale of car wrap vinyls, self adhesive vinyls, computer cutting vinyls and many advertising decoration materials Located in Guangdong Province, our company is blessed with convenient transportation facilities. All of our products are strictly complied with international quality standards and are greatly appreciated in a variety of diverse markets throughout the world. Our facotry mainly produces car wrap vinyl, carbon fiber vinyl, car sticker, self adhesive vinyl, printing vinyl and advertising decoration stickers. 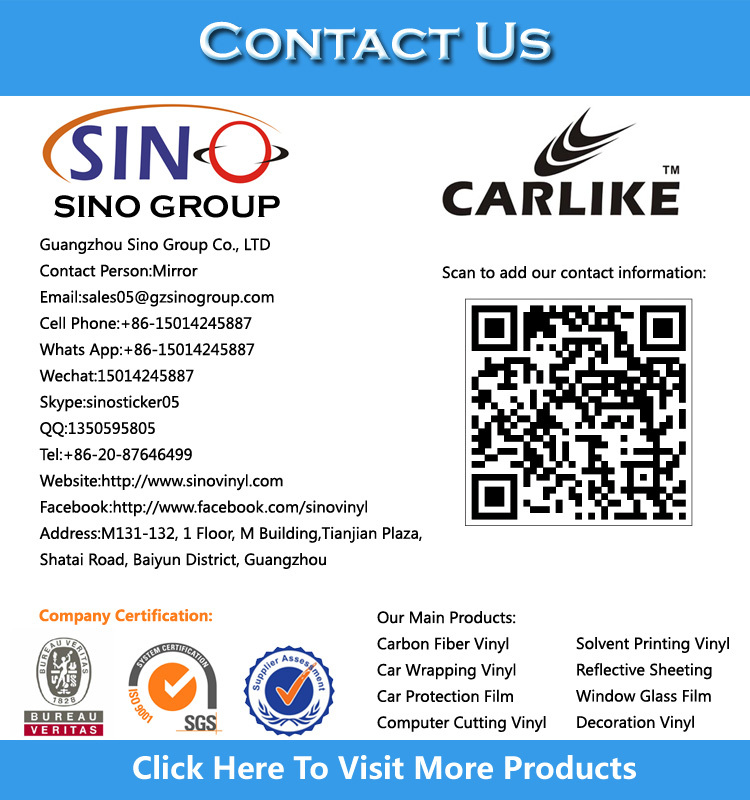 Our product brand name: CARLIKE and SINO. Our well-equipped facilities and excellent quality control throughout all stages of the productive process have enabled us to guarantee total customer satisfaction.We are currently exporting over 70% of our products worldwide. Persisting to the principle of “super quality, satisfactory service”, we have gained a global sales network reaching North America, South America, Mid East, Western Europe and Southeast Asia. It is our mission to maximize our international customers’ profitability and competitiveness. If you are interested in any of our products or would like to discuss a custom order, please feel free to contact us. Moreover, we can do OEM if you have a brand. We are looking forward to forming successful business relationships with you around the world in the near future.